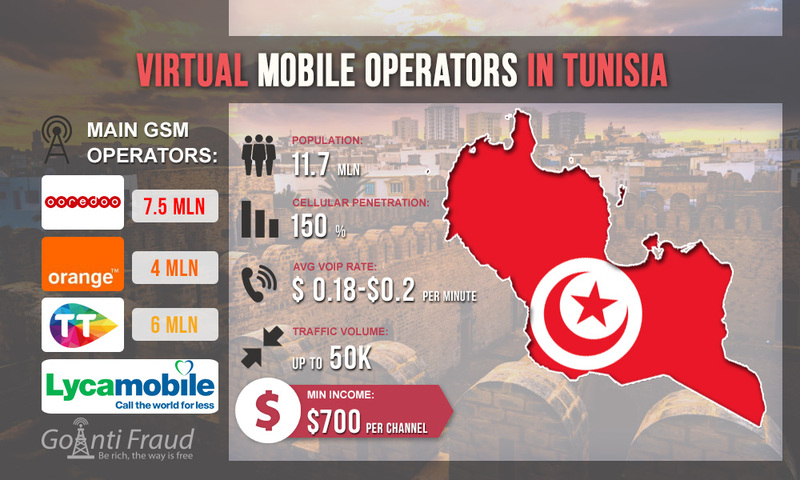 There are virtual mobile operators (also known as MVNO) in Tunisia, which are those who use the infrastructure of the main market players to provide their services. Their SIM cards can also be used for the GSM termination business. The principle of getting the maximum profit is the same: you need to select a profitable package with minutes for calls. The first MVNO in Tunisia is Lycamobile, it appeared in 2015. Already in the first six months of operation in the market, it has acquired more than 130 thousand customers. Lycamobile uses Tunisie Telecom's infrastructure and has good coverage throughout the country. SIM-cards can be obtained in branded retail outlets for free, but since in this case you will need to show your ID documents and register the subscriber's number, this option is not suitable for termination. We recommend you to look for the sellers of Lycamobile cards already registered in someone else's name in Tunisia. The second MVNO in the country is Watany Telecom, but it is not operating yet. The launching was scheduled for 2018, but according to our data, the network has not yet been launched. The new operator will also use the capabilities of Tunisie Telecom's network. Bronze. A minute of a call to any number within the country costs $0.01. Gold. A minute of a call to any number within the country costs $0.02 and it provides for a 100% bonus for topping-up. Diamond. A minute of a call to any number within the country costs $0.13 but it provides for a 1000% bonus for topping-up. Since Tunisia has a high average rate, such pricing allows making the most out of traffic landing using gateway goip-32 gsm voip or other GSM equipment.